Chris Engel is a manual transmission builder in the shop here at ZBAG who brings a solid background of mechanical experience with him to the job. Along with his automotive expertise, his past includes some hunting experiences few others have had. Chris used to work on his own vehicles, but not anymore. “They’re under warranty,” he said. He owns two Ford pickups, an F150 and an F350, and his wife drives a Subaru. His interest in hunting has led Chris to some unusual adventures. He hunts deer, which are plentiful here in southern Minnesota, but hunting bears is his favorite thing. “I’ve only done it a few times in northern Minnesota. You have to apply for a permit and get drawn. It’s easier to get a permit in Minnesota than in Wisconsin.” Chris has hunted bear three times, and has gotten two bears. He likes the meat in roast, steaks or ground. “It’s a little sweeter than venison or beef,” he explained. 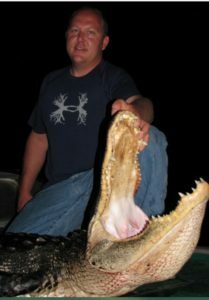 Chris’s most unusual hunting adventure was alligator hunting on an airboat in northeast Florida. He was able to harpoon an alligator and pull it in. The skin is in his freezer, but the meat had to be processed in Florida, Chris said. “You have to hire somebody, and they have to have a license.” Before the meat is eaten, it is cut into little chunks, breaded and deep fried, he said, and tastes similar to pork.